Scrub up well with a fantastic, handmade bathroom sink from MonsterShop. Our bathroom sinks are designed to fit cleanly and securely, creating stylish bathroom - instantly. Our extensive range includes freestanding sinks, corner sinks and rectangle shaped sinks crafted using robust ceramic basins. 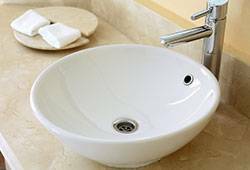 All of our sinks come with pre-punched holes, avoiding any unnecessary chips or cracks that often occur with self installed ceramic bathware. Some even come with a FREE stylish complementary tap. Our bathroom sinks are formed from elegant lines, constructed from durable materials and able to slot perfectly into a modern or traditional bathroom.